Reaffirming the superiority of the Chief Justice of India, the Supreme Court on Wednesday dismissed a Petition which questioned the unilateral power of the CJI to constitute benches “arbitrarily” and allocate work to different benches. 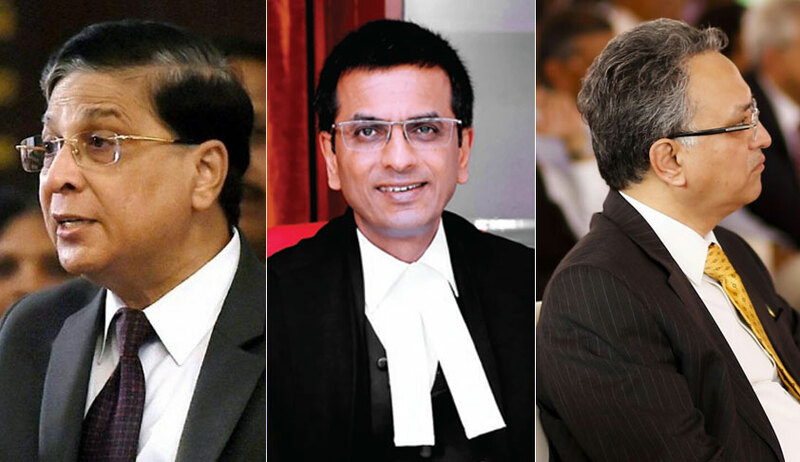 In doing so, the Bench comprising Chief Justice Dipak Misra, Justice A.M. Khanwilkar and Justice D.Y. Chandrachud also emphasized on the fact that seniority in terms of appointment had no bearing on the sort of cases that a Judge should hear. The Court was hearing a Petition filed by Lucknow based lawyer, Mr. Ashok Pande, against whom contempt proceedings had earlier been initiated by the Allahabad High Court for making allegations against several High Court Judges. Mr. Pande was, in August, 2016, awarded imprisonment of three months, along with a fine of Rs. 2,000. He had initially been issued a contempt notice after he cast aspersions on Justice A.P. Sahi for an interim order passed by him on a Petition filed by Mr. Pande’s daughter. Thereafter, Mr. Pande had also challenged the authority of the Chief Justice of the High Court for nominating the Bench for hearing the contempt proceedings initiated against him. Thereafter, pursuant to the press conference held by the four senior-most Supreme Court Judges, he had now sought framing of Rules for constituting Benches and allotting jurisdiction to different Benches in the Supreme Court and the High Courts. He had further demanded that Constitution Benches constituted by the Apex Court comprise of five senior-most judges, and that three-judge Benches must comprise the three senior most judges. Besides, he had sought bifurcation of the Court into what he described as a “Supreme criminal court”, with similar divisions to hear PIL, tax, service, land disputes and miscellaneous matters. The Court, at the outset, rapped Mr. Pande for casting aspersions against the Allahabad High Court bench which was assigned with the hearing of the contempt proceedings against him. It noted that such allegations were "unwarranted", observing, "Significantly, the correctness of an order passed by the High Court in the contempt proceedings initiated against the petitioner is not in question in the present proceedings. If the petitioner was aggrieved by a judicial order of the High Court, remedies were available to him under Article 136. As a member of the Bar, the petitioner should know better than to question the conduct of a judicial proceeding before the High Court in a writ petition under Article 32 of the Constitution. This is yet another instance of reckless allegations being leveled against judges of the High Court in a proceeding where the correctness of the orders passed by the High Court is not in issue; necessary parties to that proceeding are not before the court; and though the legality of a judicial order cannot be questioned in an original proceeding under Article 32." The Court then examined the Supreme Court Rules, 2013 and several precedents to emphasize on the power wielded by the CJI to assign cases, observing, "In view of this binding elucidation of the authority of the Chief Justice of India, the relief which the petitioner seeks is manifestly misconceived. For one thing, it is a well-settled principle that no mandamus can issue to direct a body or authority which is vested with a rulemaking power to make rules or to make them in a particular manner. The Supreme Court has been authorized under Article 145 to frame rules of procedure. A mandamus of nature sought cannot be issued." It, therefore, opined that constitution of benches and assignment of cases was "exclusively in the domain of the prerogative powers of the Chief Justice". The Court further rejected the suggestion for the listing of Constitution Bench matters before the senior-most judges, observing that this would "intrude into the exclusive duty and authority of the Chief Justice to constitute benches and to allocate cases to them". ...To suggest that any Judge would be more capable of deciding particular cases or that certain categories of cases should be assigned only to the senior-most among the Judges of the Supreme Court has no foundation in principle or precedent. To hold otherwise would be to cast a reflection on the competence and ability of other judges to deal with all cases assigned by the Chief Justice notwithstanding the fact that they have fulfilled the qualifications mandated by the Constitution for appointment to the office." The Court noted that while the plea was based on the apprehension that such a power can be exercised arbitrarily, there "cannot be a presumption of mistrust" owing to the responsibilities laden on the CJI. Thereafter, opining that the CJI does have an "exclusive prerogative" in the allocation of cases and constitution of Benches, it observed, "As a repository of constitutional trust, the Chief Justice is an institution in himself. The authority which is conferred upon the Chief Justice, it must be remembered, is vested in a high constitutional functionary. The authority is entrusted to the Chief Justice because such an entrustment of functions is necessary for the efficient transaction of the administrative and judicial work of the Court. The ultimate purpose behind the entrustment of authority to the Chief Justice is to ensure that the Supreme Court is able to fulfill and discharge the constitutional obligations which govern and provide the rationale for its existence. The entrustment of functions to the Chief Justice as the head of the institution is with the purpose of securing the position of the Supreme Court as an independent safeguard for the preservation of personal liberty. There cannot be a presumption of mistrust. The oath of office demands nothing less." Furthermore, the Court opined that the submissions made by the Petitioner for the constitution of benches in the High Courts also lacked merit. To this end, it shed a light on the aspects considered by Chief Justices while preparing the roster. These include the area of specialization of the Judge, the inflow of work and arrears, the pendency of cases in a given area, the need to dispose of the oldest cases, prioritizing criminal cases where the liberty of the subject is involved, and the overall strength, in terms of numbers, of the court. It also disapproved of the insinuation against Judges from the cadre of the district judiciary, opining that no distinction can be made between those who have held judicial office for at least ten years and those Judges who have been called from the Bar. The Court, therefore, disposed of the Petition, with a warning that the Petitioner should be "more responsible" in drafting future pleadings. Curiously, the Petition was heard by CJI Misra himself, despite the usual practice being that the CJI recuses himself in cases with the Supreme Court as the respondent, in view of the fact that the CJI is the administrative head of the Court.